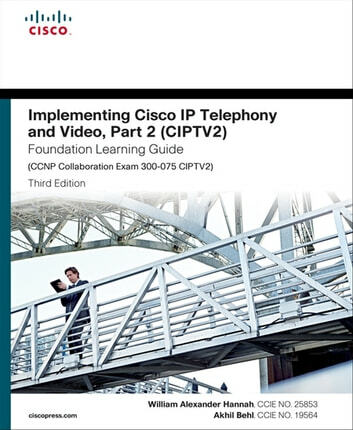 Now fully updated for Cisco’s new CIPTV2 300-075 exam, Implementing Cisco IP Telephony and Video, Part 2 (CIPTV2) Foundation Learning Guide is your Cisco® authorized learning tool for CCNP® Collaboration preparation. Part of the Cisco Press Foundation Learning Series, it teaches advanced skills for implementing a Cisco Unified Collaboration solution in a multisite environment. The authors show how to implement Uniform Resource Identifier (URI) dialing, globalized call routing, Intercluster Lookup Service and Global Dial Plan Replication, Cisco Service Advertisement Framework and Call Control Discovery, tail-end hop-off, Cisco Unified Survivable Remote Site Telephony, Enhanced Location Call Admission Control (CAC) and Automated Alternate Routing (AAR), and important mobility features. They introduce each key challenge associated with Cisco Unified Communications (UC) multisite deployments, and present solutions-focused coverage of Cisco Video Communication Server (VCS) Control, the Cisco Expressway Series, and their interactions with Cisco Unified Communications Manager. Each chapter opens with a topic list that clearly identifies its focus, ends with a quick-study summary of key concepts, and presents review questions to assess and reinforce your understanding. The authors present best practices based on Cisco Solutions Reference Network Designs and Cisco Validated Designs, and illustrate operation and troubleshooting via configuration examples and sample verification outputs. This guide is ideal for all certification candidates who want to master all the topics covered on the CIPTV2 300-075 exam.